The French sure no how to gussy up a ham and cheese sandwich. It’s called “Croque Monsieur,” and if you were looking for the perfect late-night cafe food in Paris, this would be it. Between these two slices of bread is a slice of ham and a heap of Gruyere cheese. But that’s hardly what makes this sandwich special. The French, being in love with sauces, smother it with a Bechamel sauce also fortified with Gruyere and some Parmesan for good measure. The sandwich is then baked in the oven till the cheese melts, then broiled until the Bechamel is bubbling and beginning to brown. The kids in my food appreciation classes were wild for it. 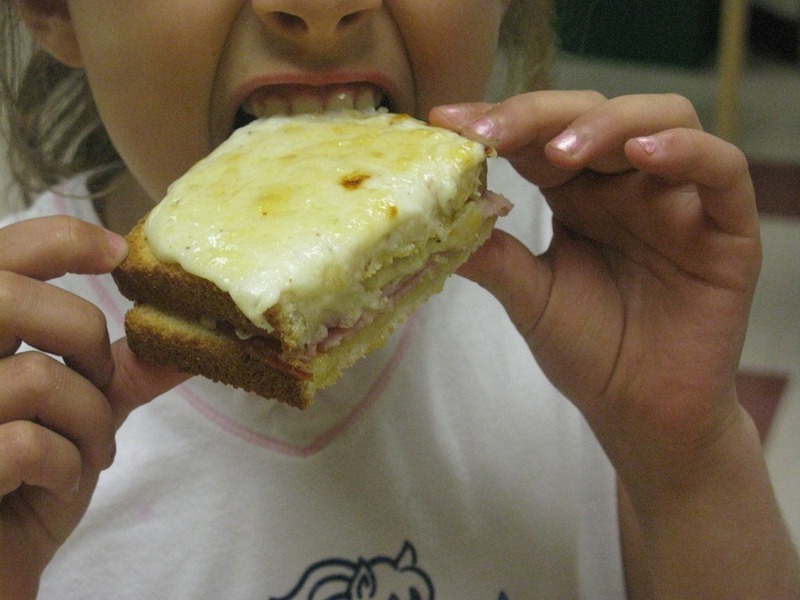 Perhaps the most important decision in making Croque Monsieur is which bread to use. I spent a good bit of time in the bread aisle considering my choices, and finally settled on a white bread from a local company that slices it more on the thick side. The bread itself is firm, not squishy. To make four sandwiches, toast the bread by laying eight slices on a sheet pan and placing them in a 400 degree oven. When the tops begin to brown, flip the bread and continue toasting for another minute or two. 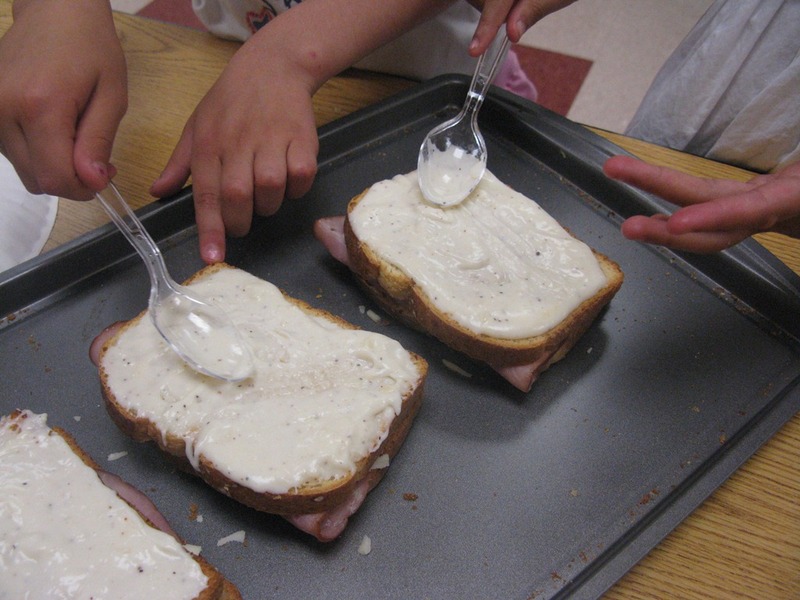 Spread Dijon mustard on four pieces of bread and on the other four lay a slice of ham–not too thin, not too thick. Sprinkle a generous amount of grated Gruyere cheese over the ham (you’ll need a total of 2 cups for this recipe). Place the bread smeared with mustard over the ham and cheese. Now for the sauce. Melt 2 tablespoons butter in a saucepan over moderate heat and whisk in 2 tablespoons all-purpose flour. When the flour begins to bubble, whisk frequently and cook a minute or two. Slowly add 1 1/2 cups warm milk, whisking continuously. As the sauce heats, it will thicken. The sauce should be rather thick, but not pasty. Add more milk if necessary. Off the heat, stir into the sauce 1/2 teaspoon kosher salt, 1/4 teaspoon freshly ground black pepper, pinch nutmeg, 1/4 cup grated Gruyere cheese and 1/4 cup grated Parmesan. Slather the sauce over the tops of the sandwiches, then place in a 400-degree oven for six minutes. Turn on the broiler and monitor closely. Remove the sandwiches when the sauce is bubbling vigorously and just beginning to brown. You’ll probably want to allow the sandwiches to cool a bit before serving. They can be sliced in half, or even into quarters.